So the waiting is over and we now know the future for D&T as embodied in the new National Curriculum. The document is slim with just five pages of subject content to cover all three Key Stages. There is no padding, no waffle and everything is statutory. The document makes it very clear that students need to engage in real design tasks that lead to real, practical outcomes. It is also clear that students need to be employing relevant, contemporary techniques to achieve this. Whatever other hand or machine tools are employed, CAD/CAM needs to be a significant feature of how students make products. 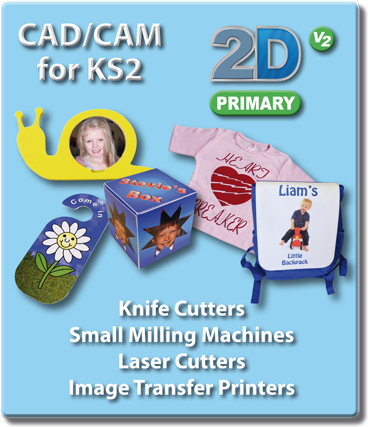 CAD is now required at KS2 and there is no reason why pupils can’t use simple CAM output to achieve high-quality products for an ‘increasingly technological world’. CAM is now statutory at KS3. This does make sense. In economic terms, hand-made products are no longer the way our country competes in global markets. CAM output does, of course, require students to create CAD files so it’s safe to say that CAD/CAM is now statutory – at least at KS3. Practical skill gained ‘at the bench’ does, however remain an important means by which students can learn about materials, how they work and what techniques are best for any given project. No need for talk about babies and bathwater, it’s just a matter of prioritising what is important about the way the designers and engineers create the products we use every day. CAD/CAM is clearly an important part of this. Teachers now need to put the fat on the bones and prepare schemes of work that will deliver a coherent experience.A daunting task maybe but, for most, it will be evolution not revolution. 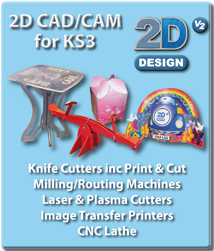 Most schools will be very familiar with our flagship product and many will already have developed cross-phase partnerships to help KS2 colleagues introduce CAD into their D&T curriculum. We continue to work hard to make sure these are the best creative platforms available for technical drawing and graphics including pattern generation for fabrics and embroidery. 2D Design and 2D Primary also provide the simplest route possible for CAM output using knifecutters, milling technology and lasers. Sublimation or Laser Image Transfer using appropriate printers are another area which users of our software often explore. Going 3D with SolidWorks may seem like a big step but embracing 3D CAD alongside 2D Design will take product design (in particular) to the next level. 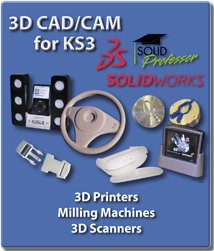 SolidWorks gives students access to one of the most commercially relevant CAD systems available and it’s what they are likely to find at University, College or in future employment. The SolidWorks Education Edition provides ‘home-access’ for all students and experience shows us that once students get started, there’s no stopping them. There’s a temptation to think TechSoft’s 2D Design software is a sort of ‘nursery slope’ that leads to SolidWorks but this is not true. Nor is it true that if you are doing great things in 2D Design, there’s no need to get into SolidWorks. 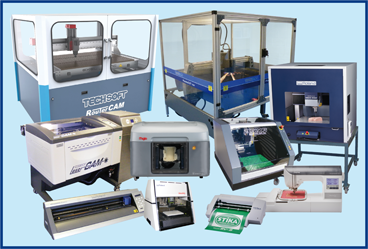 2D Design has been created to give students all the tools they need for accurate CAD drawing and seamless output to ‘2D’ machines; millers, knife cutters, lasers - even Plasma cutters. Simplicity of output and the ability to be creative with both vector and image data all on the same workpage means 2D Design will remain a key resource for students. And, of course, not everything in D&T is a 3D product. 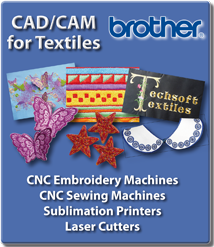 2D Design will remain all students need for creating stunning graphic products and the ideal tool for producing patterns for printing and designs using Brother CNC embroidery machines. TechSoft have long been encouraging the use of 2D Design for Textiles students. CNC knife-cutting provides a simple, low-cost but highly effective way to apply bespoke graphics to any number of textile products. Image transfer using our sublimation systems allows students to work with their own ‘custom’ fabric designs. Laser cutting and engraving provides new opportunities for the most delicate of applique and layered designs and, of course, there is CNC embroidery. We know how popular our Brother machines are and, since introducing them, we have certainly enjoyed exploring how to get the best out of them. One of the strengths of our approach is that all the creative work can be done in 2D Design - so whole class access is not a problem and there’s every chance schools already have a Site Licence. If students are using 2D Design in other areas of D&T then learning can be transferred and re-enforced as they work in different material areas. If we thought we had this all (ah-hem) sewn-up then we were to think again. Heidi Ambrose-Brown joined our sales and training team earlier this year and has brought her considerable experience, indepth knowledge and buzzing ideas to bear on what we can offer for textiles work using the latest CAD/CAM products. It is all driven from 2D Design and her ideas have amazed us all. Already very well known for her inspirational and highly effective training and support, Heidi is now running TechSoft courses to spread the message.